Coaching Activities makes it easy for Managers and Coaches to find what activities they need to complete for their programs and teams on both web/mobile. There are 3 main components: Activities, Notifications, Emails. Activities are actions the Manager or Coach needs to complete to “coach” the person in a pitch, test, or story. They are separated into two lists, Pending and Completed. Pending activities are listed in chronological order (recent to oldest) while Completed activities are listed by completion date (recent to oldest). You can dismiss any Pending activity be selecting the “X” in the activity. This activity is triggered when someone on your team or in a huddle submits an essay question within a test. After selecting the activity, it is marked completed once you submit the grade for the test. 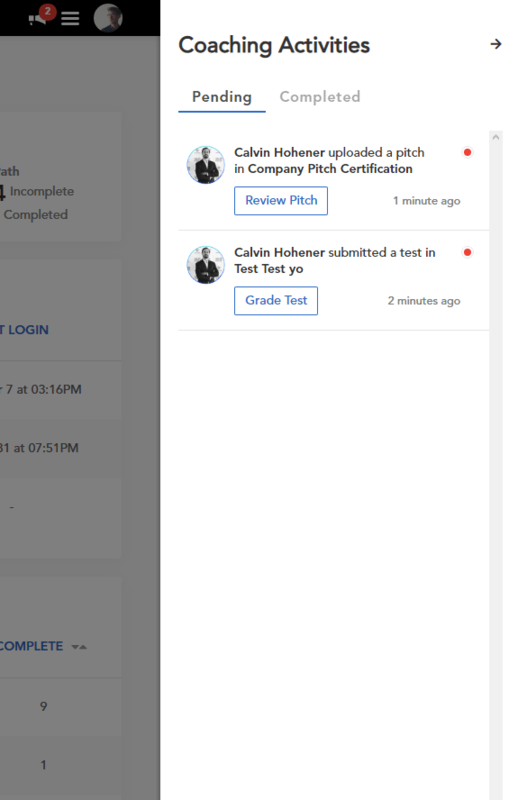 As a Manager or Coach, before you publish a huddle with a test there is now an option to select who grades the test. The options are Host of the huddle or learning path and Participants Manager. The Host is the person who is managing the program (as seen on the overview page of a huddle or learning path). The Participants Manager is the person who manages each participant of the program. These options affect who receives the activity in Coaching Activities to grade, although does not affect emails sent when a test is submitted or graded. The Test Grader is marked on the test and in the emails. Anyone (with permission) can grade the test, however, only the Test Grader will receive the activity. If someone that is not assigned as Test Grader grades the test, it will be displayed “<Name of grader> has graded the test” in Coaching Activities Completed section. This activity is triggered when someone on your team or in a pitch submits a pitch. Both the Host of the pitch and the Participants Manager receives the activity to review the pitch. 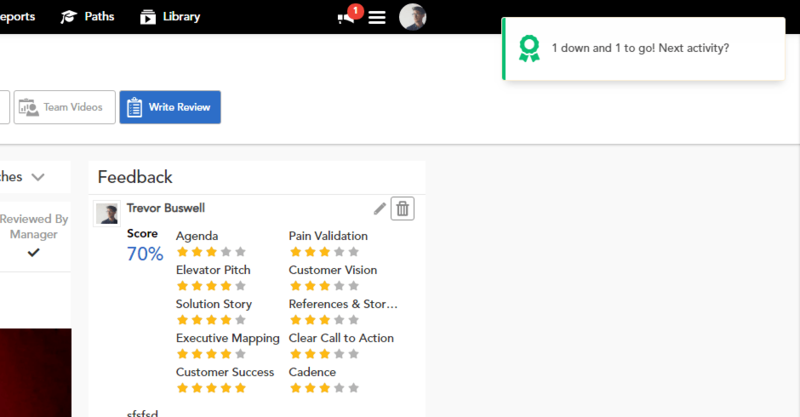 The activity is marked completed when you submit a review for that user. This activity is triggered when a member of your team submits a story. Only the manager of the story submitter receives the activity and is marked completed once they finish watching the story. As you are completing activities, we will display notification to remind you how many activities are left and when they are completed. If you do not login after a few days, we will also notify you that there are pending activities. Notifications are web only and do not send push notifications on mobile. Every week we will update you on the # of pending activities you have by person so you are informed on who needs coaching. 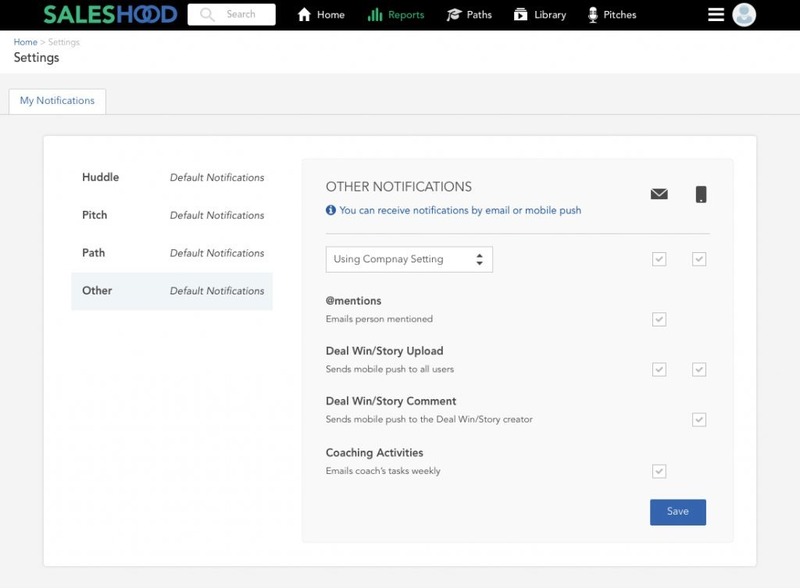 The email is sent to all Managers and Coaches in your instance, this can be turned off in the Notifications Manager. All the functionality listed above is also on mobile! You can see and take action on each activity.